Concept map diagram guide or tutorial helps you better understand concept map diagram so that you can make full use of it for good purpose. Concept map diagram depicts suggested relationships between concepts. Concept map diagram can be used as a learning and teaching technique, by visually illustrating the relationships between concepts and ideas. In teaching field, concept map diagrams are used by teachers to help students organize and represent knowledge of a subject. 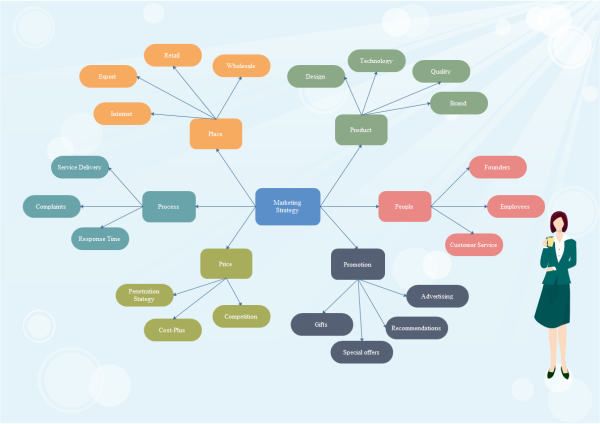 Concept map diagram is a graphical tool that designers, engineers, technical writers, teachers and others use to organize and structure knowledge. Concept map diagrams include concepts, usually enclosed in circles or boxes of some type, and relationships between concepts indicated by a connecting line linking two concepts. When created correctly and thoroughly, concept map diagram is a powerful way for students to reach high levels of cognitive performance. A concept map diagram is also not just a learning tool, but an ideal evaluation tool for educators measuring and assessing the growth of student learning. With the help of concept map diagram maker, you can quickly and correctly make a concept map diagram. Concept maps were developed in 1972 in the course of Joseph D. Novak's research program at Cornell University where he sought to follow and understand changes in children's knowledge of science. During the course of the research effort, he found that concept maps were useful not only to represent the change in children's understanding of a topic, but also to express participating graduate students' understanding of their courses. 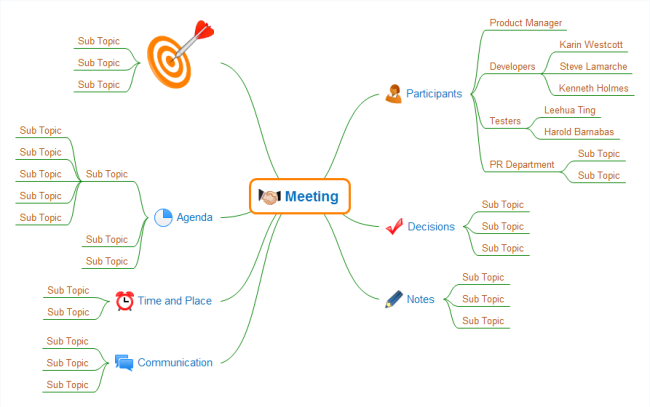 Check out how to create a good concept map diagram before you start. The popularity of concept mapping soon spread and now its used all over the world as a means to represent a person's knowledge about a domain of knowledge, by users of all ages and in all domains of knowledge. Now concept map diagrams are widely used in business to gain an insight on the overview and for brain-storming new ideas and developments. By understanding the whole picture of the concept map diagram, how each concept is related and sub-related to each other which are illustrated in a hierarchical framework, learners will find deep learning. As you can see that there are lots of advantages in using concept map diagrams. Concept map diagram encourages collaborative learning and team knowledge mapping which make it easy for people to understand complex concepts or ideas. Concept map diagram can be used in a large class setting either individually or collaboratively, by giving the students a partially filled concept map, or a few concepts to fill on the maps. 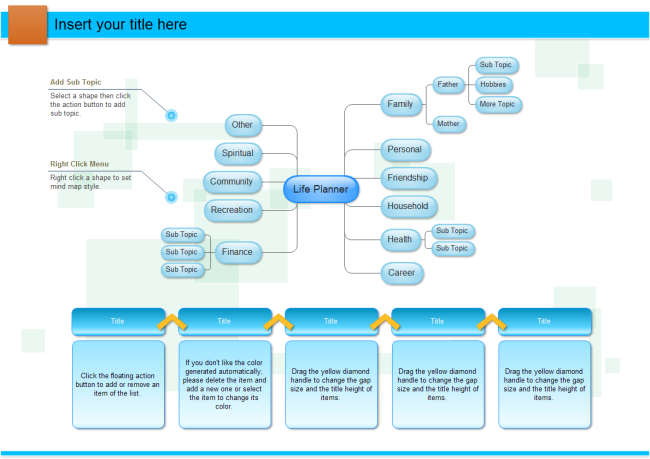 The picture below is a life planner concept map diagram drawn via concept map diagram maker. From the picture you can see that the central concept is life planner. For planning a good life, you need take good care of your family, personal stuffs, friendship, household, health, career, recreation, spirtual, finance, etc. By just glancing at the picture you will clearly know that what you should to get a better life.